Windows can be a strong tool in visually enlarging a small room because your eye moves beyond the wall to the outdoor view and embraces it as part of your living space. Take advantage of this liberating effect by leaving windows bare, or dress windows with draperies that match the color of the walls to eliminate boundaries and open the space. For privacy, install simple shades or blinds that can be pulled out of the way during the day. If your house is too small to meet all your needs, gear spaces for double duty. A daybed anchors this living room by mimicking the look of a trendy, extra-deep designer sofa -- and scores space for guests to sleep. Look for a daybed with a solid back for all-day lounging support. 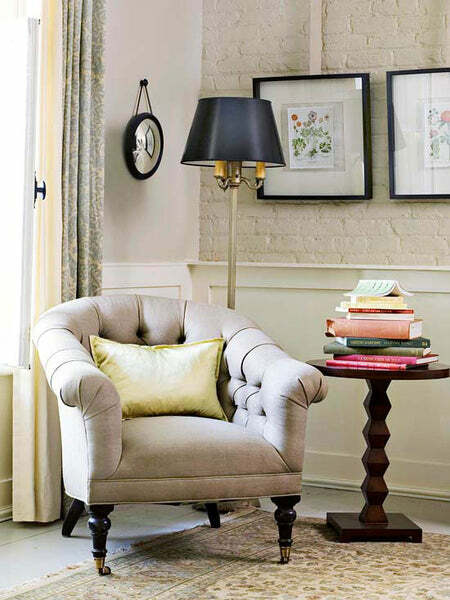 Cap off the ends with a pair of bolster pillows to imitate the rolled arms of a sofa. Two small tables work together as a larger coffee table but move aside easily to give guests more space. It's an age-old decorating adage: light colors open up a room, while dark colors keep a space cozy. To give your room the illusion of spaciousness, bathe it in white. White surfaces bounce light around the room, keeping a small space feeling bright and open. In this narrow bathroom, white walls, a white bathtub, and an off-white vanity reflect light, giving the feeling of spaciousness. Dark tile floors ground the room. White grout lines break up the tile, ensuring the black tile doesn't weigh down the room. Rather than using white walls as a backdrop for colorful accents, try the opposite effect. The green wall color here connects the room to the scenery and spaciousness outside, while white furnishings, white accessories, and white-painted architecture keep the room open and bright. 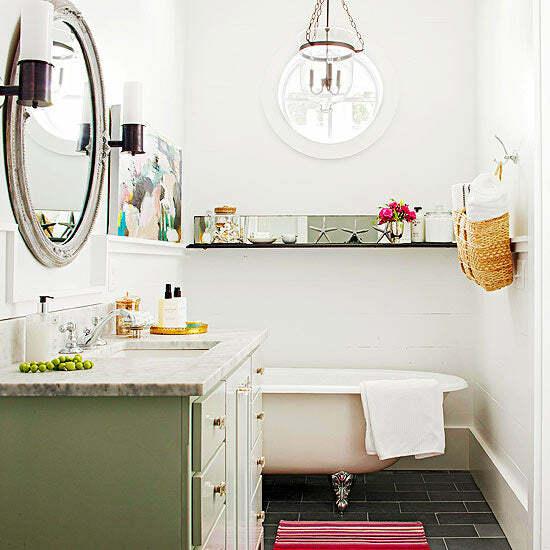 A handful of green accents ties it all together. Hang a large mirror with a decorative frame (or prop it against a wall) to create the illusion of depth in a small room. Even small mirrors expand the sense of space by reflecting views and light, but an oversize mirror like this one has a dramatic effect because it reflects a large chunk of the room. 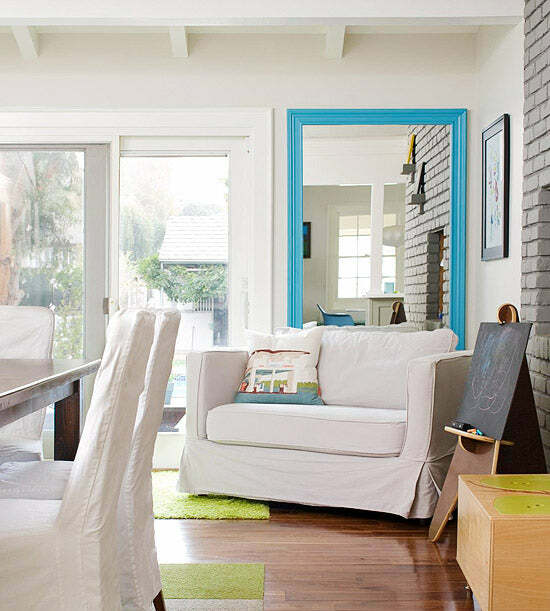 When it comes to small spaces, too many colors can be chaotic. Select a few and stick with them. 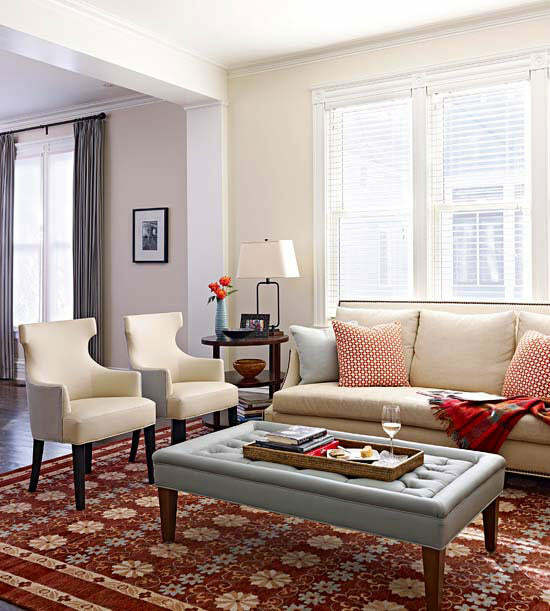 In this living room, a cream background is accented with sky blue and rusty red. The colors add personality without overtaking the space, and the muted tones are far more subtle than fully pigmented hues, which also softens their impact. Choose from more than 400 house plan designs offered by Archival Designs in a wide range of styles and sizes. Some of our more popular house designs include European-inspired Georgian and palladian homes, English manor house plans, Tuscan-style Italian villas, French chateaux, and colonial house plans. Our Tuscan-style villas range from 1800 sf to 14,814 sf. Our Newport classic house designs range from 1500 to 5000 sf. Starter Castles, mansions and estate homes are designed in the grand tradition of some of the most impressive homes in the world. Please feel free to search our house designs offered. These plans have been built around the globe, from Canada to Dubai, and one could be just for you!